I wrote recently that I see world-building in SF and fantasy as coming in two chief varieties, the speculative and the meticulous, and that those varieties offer different kinds of literary interest and pleasure. Ursula K. Le Guin’s Earthsea falls on the speculative end of the spectrum, Tolkien on the meticulous end. Here’s another binary: the accommodating and the perverse. I’m not sure that I’ve placed any of these texts with precision, but it’s a start. Most of them will be familiar to most of my readers, but perhaps not China Mieville's Bas-Lag series and Steven Erikson's Malazan Book of the Fallen. I was tempted to identify Gene Wolfe's Book of the New Sun series as strongly meticulous and strongly perverse but then decided that both of those designations are potentially misleading. I've also been re-reading Thomas Pynchon lately, and was tempted to mark Gravity's Rainbow as strongly speculative and off-the-chart perverse, but that needs more thought also. I’m happy to entertain any corrections or suggestions in the comments below. One quibble with your nomenclature. "Speculative" is a term often used to refer to all types of writing in the SF/Fantasy/Horror genres and so is somewhat confusing here (e.g., "world-building in speculative fiction can be placed on a continuum between speculative and meticulous"). In your original post on this subject, you defined "speculative" in terms of "surprisingness" or "oddity" or "quirkiness". 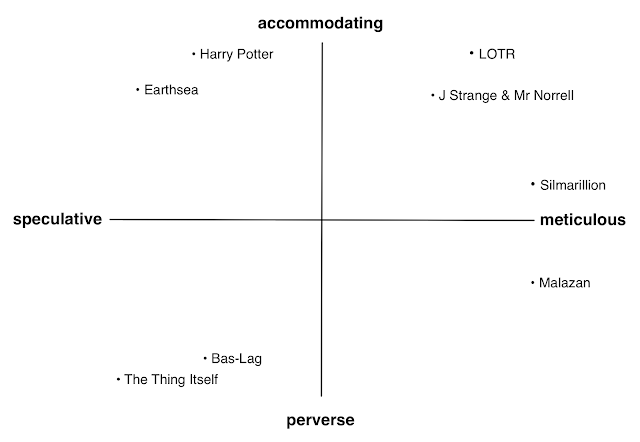 I think those terms better capture the difference between, e.g., the world of Harry Potter vs. Middle Earth. Perhaps instead of "speculative" you might consider a different term? Easier said than done, I know. I've tried to come up with an alternative and the best I can do is "whimsical." As I started to read your post, I immediately thought I should challenge to place some of Gene Wolfe's books. Of course, you realized that too. Maybe he's the point at infinity, both meticulous and speculative? I'd say more perverse than accomodating, however. His more recent stuff is perhaps even more perverse, though in unusual ways. L in L, the term "speculative" as I use it doesn't have anything to do with whimsy — I use it to describe works that deal in speculating, in what-iffing, without worrying too much about working out every detail. For instance, in The Left Hand of Darkness Le Guin speculates about how a culture might be different if its people could be either male or female, but only at certain times, being otherwise functionally neuter. She provides enough details of how such a world might be ordered to be dramatically convincing, but not in meticulous detail — whereas the Silmarillion, for instance, is a much more carefully painted-in world. I'm sure you're right, though, that there are better terms to express the contrast. But doesn't "speculative" as you are using it apply to all SF/Fantasy? The Silmarillion and LOTR are just as speculative as The Left Hand of Darkness. Tolkien speculates in the overall conception of his world (what if there were these two languages, which I am "discovering"? Are they related? How did they develop? What is their history and the history of their speakers? Who are those speakers? How does their language relate to their wider culture?). He also speculates in the smaller details (what would you get if the Anglo-Saxons were a horse culture?). But on the x-axis of your plot, you are not describing the nature of the what-if, but the degree of detail and consistency in working out the world that results from that what-if. And not just the detail and coherence, but the flavor and tenor as well. Two authors could start from the same speculation (e.g. what if aliens arrived on Earth tomorrow) and you could end up with two different world-buildings, one on the right of the continuum (meticulous) and one on the left (_____). As I said originally, this is a quibble. I understand your typology. But if the x-axis is the flavor, tenor, and degree of detail and coherence in the world created by the author of a speculative fiction, then I think the use of "speculative" to name one end of that axis is a bit confusing. Dude, I already said, "I'm sure you're right, though, that there are better terms to express the contrast." Can't you take Yes for an answer? My gripe with your terminology is that you've put me on a map way down an axis marked 'peverse'. Because one can be both perverse and a pedant, OK? Adam: good grief. My typing lately has been peverse in the extreme. That's one error fixed, anyway. I'm not sure I understand the perverse-accommodating axis. Is it about attachment to linearity in plot? About concern for traditional genre conventions? About how stylistically experimental the author is willing to be? It's not clear to me that either Mieville or Erikson (The Thing Itself is on my list, but I haven't gotten to it yet) have anything in common based on any of those things, as compared to the books you label accommodating, which is why I'm not sure I'm following you. It is interesting that they both have their roots in table top role-playing, to an extent. Jesse, I think there are multiple ways to be perverse, that is, not to "accommodate" readers' expectations -- all of the ones you mention are possible. But both Erikson and Mieville are especially interested in defying or upending genre conventions, and in similar ways. For instance, Adam Roberts has written recently about the pastoral emphasis of LOTR, the ways the bucolic Shire is contrasted to the industrial world of Mordor, and Erikson and Mieville both want to refuse or reverse that polarity, along with others (e.g. Tolkien's conventional ways of imaging beauty and ugliness). 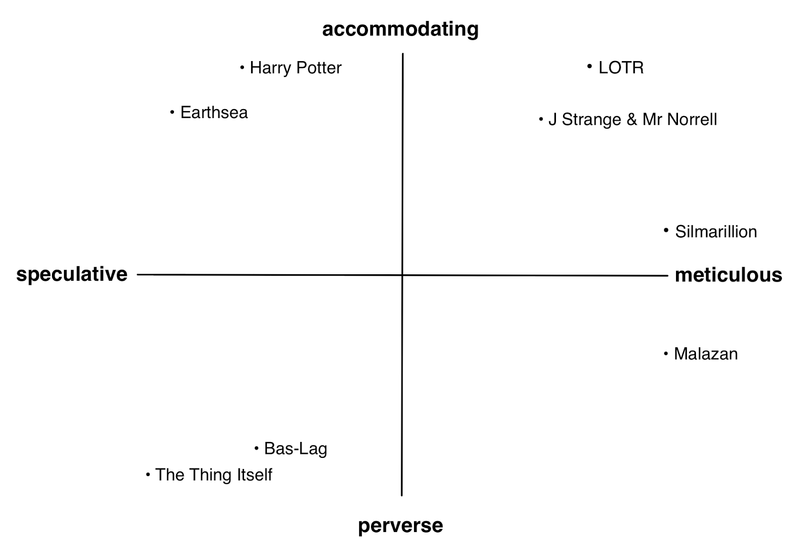 Would you put a Song of Ice and Fire in the Meticulous and Perverse quadrant? I'd put it as probably closer to LOTR than Malazan in terms of meticulousness and between Malazan and Bas-Lag in perverseness, but probably closer to Malazan.